After the storm comes a rainbow! Well, not exactly. But since August saw so many search engine ranking fluctuations due to Google’s broad core algorithm update, it made sense that the Google engineers would back off a bit in September and let the new changes take effect. To look at the hard data of what Google is up to, we rely on our friends over at Moz, who provide the daily MozCast: a “weather report showing turbulence in the Google algorithm over the previous day.” Moz develops its temperature reading with the help of 1,000 specific keywords, tracked every 24 hours. They grab the top 10 search engine results, and compare to the previous day. This lets them (and us) know if Google’s engineers are moving things behind the scenes. 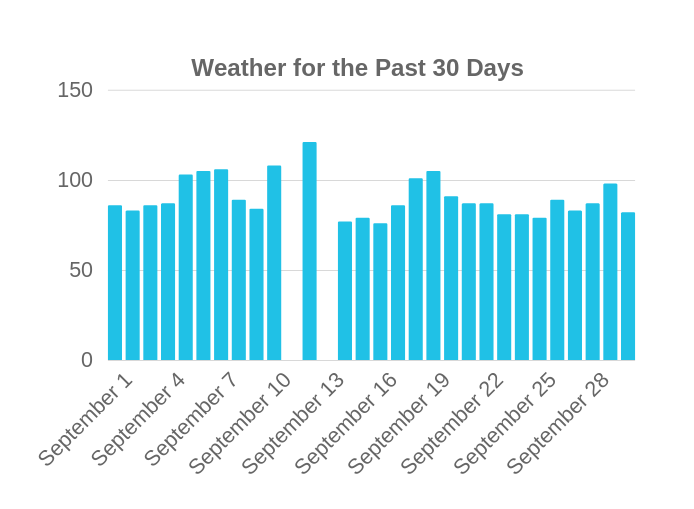 How “hot” was it in September 2018, according to MozCast? September was almost delightful! We saw some rare cloudy days in the middle of the month, though there were roiling clouds before that between September 5th and 7th. September 12th was positively broiling, with a high of 121 degrees; but afterward, the weather calmed down. Rain seems to be pretty constant over the Googleplex in Mountain View, California, but perhaps later this year we’ll get a rare “fair” day? *0° sunny indicates no reading was taking that day. As of September 14th, some Google experts noted that Google My Business review replies were editable from the Knowledge Panel! Perhaps that accounts for some of the movement behind the scenes of Google’s algorithm? GMB is increasingly important in your rankings, so make sure you keep your profile as up to date and user-friendly as possible! The AccuRanker Grump wasn’t quite as mellow as Moz near the middle of the month, still showing plenty of “furious” Google updates according to its metric: comparing the top 100 of 30,000 randomly selected keywords from the previous days’. In fact, the Grump was much angrier in September than he was in August! In contrast to Moz, the Grump showed incandescence at the tail end of the month, with a furious “20.61” rating! We guess he detects some updates coming in early October. The Roo sensibly chose the middle ground between Moz’s up-and-down weather and the Grump’s month of fury. Algoroo hit “high roo” on September 7th, showing some pretty serious Google SERPs volatility, but otherwise showed that Google was backing off a bit afterward. Its reading of the situation was accurate, because Google-watchers spotted some big changes taking effect after September 8-11, notably that “an increase in local ranking has a corresponding decrease in organic ranking.” Algoroo also noticed a slight hop in volatility at the end of September. If your local ranking increased while your organic ranking decreased, do not fear—it’s just Google being Google; aiming to bring users the best experience while balancing the needs of businesses. Most of the data we looked at in this blogs indicate that Google is continually working on GMB, and likewise giving it priority in local searches. SLS Consulting has a lot to say about the importance of local search to our clients—having a consistent name, address, and phone number in all your listings; answering FAQs on Google My Business; and responding promptly to reviews, good or bad. As more Internet browsers go mobile, we predict local search engine results will lead to more leads and, ultimately, more conversions. Don’t neglect your local! Want more marketing tips, or notes on how Google ranks you? Want to chat with SLS about your local strategy? Call at (323) 254-1510 today.